The Birmingham Post recently published a ‘list of shame’ of local bodies that don’t make their information available by RSS. It’s pretty damning, and Birmingham City Council are one of the worst offenders — which a Brummie worries me (and is why I use them as an example here, but it’s a problem everywhere, with all types of organisations). They’re working on a new website, which you would hope would help, although their recently launched site for the ‘Big City Plan‘ has a news/events page without a feed — which indicates to me that the people ordering this stuff don’t seem to get it. It seems that organisations think that this technology is a ‘nice to have’, or an ‘extra’ – rather than the building block of the social web and the most important way to distribute your information there is. They’re waiting for it to reach ‘mainstream’ adoption, or at least for the voices demanding it to come from the media. Which is why the Post taking a bit of a stand is important. But I would say that RSS is almost more ‘mainstream’ than the press. According to a Forrester report (the report is paid for, I gleaned info from it from around the web), 11% of US internet users use RSS. This might well be on the high side – but it’s the most thorough survey I can find. In 2008, 16.5 million households in the UK (65 per cent) had Internet access. Which means that if we follow US patterns of usage (and we’re quicker, better, faster than them, right?) 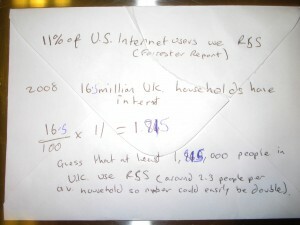 at least 1,815,000 people use RSS in the UK. Average household size in the UK is around 2.31 people, so the number could be almost double. That’s my ‘back of an envelope’ calculation (see, I actually did it on the back of an envelope), it’s not scientific but it’s the best I can get without commissioning my own surveys. Is 1.82 million people ‘mainstream’? I like to think of RSS as ‘quality news’, so let’s compare it to other sources of ‘quality news’ – Newsnight’s average viewing figure is around 1,000,000. And ‘quality newspapers’ average daily sale (latest ABC figures): Guardian 358,379, Independent 201,113, Times 621,831, Telegraph 835,497 – adding up to 2,016,820 (actually some 45,000 of the Telegraph’s sales are abroad, so UK sales may well be lower than this). That would leave RSS adoption slightly less than broadsheet reading, but way above those watching the Beeb’s flagship news magazine programme. But is quality news mainstream? Maybe not, but I bet people who watch or read aren’t dismissed as ‘geeks’. In fact most organisations spend vast sums of money for just the chance to get their message out to these people. And it isn’t even either/or – as Joanna demonstrates using RSS is more likely to get your information out to the quality press. Estimates suggest that the largest participation sport in the UK is fishing, one million licences sold a year with maybe 3 times that having a rod, a line, and a mouthful of maggots at the weekend. So RSS is (very roughly) of the same order of magnitude as our most popular activities. But perhaps fishing is a bad example, it certainly doesn’t get much media coverage. Let’s try football. 1,072,402 people attended League Cup football matches last season (from Wikipedia, caveats apply) — or there were 1,072,402 tickets sold, people supporting teams that played more than one match will have gone more than once. Luckily for the ‘mainstream’ a lot of people who attended these football matches did so with their mobile phones, their cameras, laptops, their large Outside Broadcast trucks, chains of command, broadcast rights, satellites and TV networks and pushed the information out to other people. So football is ‘mainstream’, but actually getting out of the house and watching it is less done than getting your information via a format based on XML. But it’s more than that, people who get their news from and other medium – TV, radio, papers, paper’s websites, blogs, in my case people down the pub – are indirectly benefiting form RSS as the people that filter the news are using RSS. I propose that we stop making excuses, RSS is more than mainstream. It’s a huge and fast growing method of news delivery – one that is almost cost-free once you’ve decided to have a website. If you are an organisation that wants your information out and read by people, you are doing yourself a disservice by not using it. If you don’t understand it, you need to hook up with someone who does. I’m going public, I want people to supply me with RSS and I’m going to – politely – request that they do so. They’re not doing ‘some geeks’ a favour, they’re doing one for themselves. 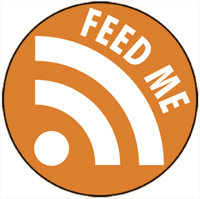 I’ve had 200 badges made with “Feed Me” on, and I’m going to wear one all the time – and help explain the ‘RSS deal’ to anyone who asks me what it is.